Teen pregnancy can create substantial stress within families. The pregnant teen and her parents may have anxiety about the cost of raising a baby, the teen’s health and well-being, and the impact of early parenthood on the teen’s future. The C.S. Mott Children’s Hospital National Poll on Children’s Health asked a national sample of adults with children 0-18 about their views on how states should support pregnant teens. Most adults felt that the state should play a role in supporting pregnant teens: 81% agreed that state support for pregnant teens is a good investment so the baby will be healthy. At the same time, adults expressed some hesitation about broad state responsibility: 56% agreed that when a teen gets pregnant, her parents should be financially responsible. Thirty percent of adults said community and religious groups, not the state, should take care of pregnant teens. The majority of adults felt their state definitely should provide medical care for pregnant teens (60%) and for their babies (69%). Adults were less certain on whether their state definitely should provide formula (52%) or car seats and other baby supplies (42%). Women were more likely than men to believe the state should provide medical care, formula and baby supplies for pregnant teens. Although 90% of adults agreed that states should do more to require financial support from the baby’s father, fewer felt their state definitely should provide legal help to get child support (53%) or paternity testing (44%). Women and men expressed comparable support for state assistance with paternity testing. However, women were more likely than men to believe their state should provide legal help for pregnant teens to get child support. Twice as many adults felt their state definitely should provide adoption services (61%) compared to abortion services (26%). The vast majority of adults believed that pregnant teens should meet certain requirements in order to receive state support, including attending prenatal visits (90%), parenting classes (88%), drug testing (85%), and finishing high school (78%). 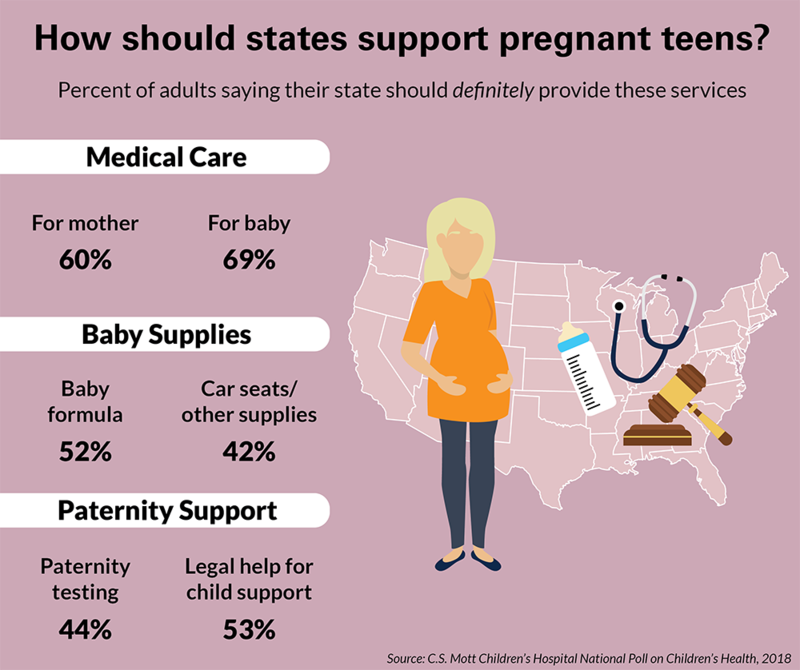 Seventy percent of adults felt that pregnant teens should meet all four requirements in order to receive state support. 8 in 10 adults agree that state support for pregnant teens is a good investment in the baby’s health. Most adults feel pregnant teens should be required to attend prenatal visits or take parenting classes in order to receive state support. 9 in 10 adults feel that states should do more to require financial support from the baby’s father, but only half support their state providing paternity testing or legal help to get child support. In most families, the teen years include memorable events, like learning to drive, getting a first job, going to prom, or graduating from high school. Few teens – or their parents – include “getting pregnant” on that list. But when teen pregnancy happens, there are real challenges to face, and families may not be able to meet those challenges on their own. This Mott Poll illustrates that most US adults with children 0-18 believe there is a role for state support of pregnant teens, but with certain limitations. The most consistent viewpoint pertains to supporting the health of the teen mother and her baby. Eight in ten adults in this Mott Poll agreed with the rationale that state support for pregnant teens is a good investment so the baby will be healthy. Most adults expressed a strong belief in health-related support, with sixty percent indicating that their state definitely should provide medical care for pregnant teens and their babies. Adults prioritized health even when offering their views on whether pregnant teens should face requirements in order to receive state support: the most-endorsed requirements were attending prenatal visits (90%) and taking parenting classes (88%). As parents themselves, adults in this Mott Poll recognize that the cost of having and raising a baby is substantial, but many are hesitant to place that financial burden on the state. Over half felt that parents should be held financially responsible if their teen gets pregnant. It’s likely that many parents feel that limited state funds should be dedicated to pregnant teens whose families cannot provide financial support, or who are separated from their families. This strategy makes sense, as long as there are processes to identify the pregnant teens who need support and sufficient resources to meet their needs. This Mott Poll found a very strong endorsement that states should do more to require financial support from the baby’s father, yet only lukewarm support for states providing assistance with paternity testing and establishing child support. This assistance may be particularly critical for teens, who likely are unfamiliar with the terminology, processes, and legal requirements around paternity testing and child support. Moreover, pregnant teens may be emotionally vulnerable with respect to the baby’s father. Thus, to achieve the broadly-supported objective that states do more to require financial support from the baby’s father, funding to support this type of assistance and advocacy may be necessary. Adults in this Mott Poll strongly endorsed requirements that pregnant teens engage in health and educational activities in order to receive state support. Such requirements would promote personal responsibility for the pregnant teen, while enhancing her health and well-being. However, complicated questions can arise when pregnant teens fail to meet requirements, and the consequence for non-compliance may have a negative impact on the health of the pregnant teen or her baby. A thoughtful approach to implementing requirements would be required. Finally, this Mott Poll highlights some key differences in the attitudes of women and men. Overall, women were more likely to endorse a variety of strategies to support pregnant teens. This may reflect women’s empathy with their situation, or their recognition that in many cases, it is the teen mother – not the father – who pays the financial, emotional and social cost of having a baby. How should states support pregnant teens? This report presents findings from a nationally representative household survey conducted exclusively by GfK Custom Research, LLC (GfK), for C.S. Mott Children’s Hospital. The survey was administered in November 2017 to a randomly selected, stratified group of parents age 18 and older (n=2,005). Adults were selected from GfK’s web-enabled KnowledgePanel® that closely resembles the U.S. population. The sample was subsequently weighted to reflect population figures from the Census Bureau. The survey completion rate was 60% among panel members contacted to participate. The margin of error is ±2 to 4 percentage points. Clark SJ, Gebremariam A, Singer DC, Schultz SL, Freed GL. What to expect around supporting pregnant teens. C.S. Mott Children's Hospital National Poll on Children's Health, University of Michigan. Vol 31, Issue 4, April 2018. Available at: https://mottpoll.org/reports/what-expect-around-supporting-pregnant-teens.